Don't like the fact that Ballistic Weave can't be applied to your favorite clothing, hats, or outfits? Annoyed by the fact that the Combat Armor Helmet has a light that doesn't work? Do you want to lurk in the darkness like Sam Fisher? How about a more efficient Jetpack? Well then this mod is for you! You will now be provided a holotape that will allow you to adjust the various Ballistic Weave settings. 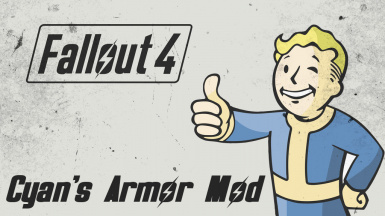 Added Nuka World clothing and hats to the Ballistic Weave mod-able list. Added Padded and Dense Asbestos lining mods to Disciple, Operator, and Pack chest armors. Removed loose scripts and reverted back to using .ba2 archive file for all meshes, sounds, and scripts. IMPORTANT NOTICE: PLEASE PERFORM A CLEAN SAVE BEFORE UPDATING TO v1.1. PLEASE READ CHANGE LOGS BEFORE UPDATING. IF YOU'RE NOT SURE HOW TO DO SO, HERE'S BRUCE WAYNE HIMSELF TO EXPLAIN THE PROCESS, CLICK ME. Credit be to Wenderer for his wonderful FOMOD Creation Tool. Go check him out over there ---> CLICK ME! Greetings and well met fellow Vault Dwellers! Here I will explain all the changes and additions that will hopefully prove useful to you. In summary, I have made a few changes to Ballistic Weave, Combat Armor Helmet, Marine Tactical Helmet, Jet Pack, and Dog Armors. More details covered below. My approach to modding in Fallout 4 mostly revolves around making subtle adjustments to bring as much of the game closer to a balanced state than it is otherwise, to the best of my ability. My goal with this mod, among others, is to integrate my changes to that they blend in seamlessly with the game that Bethesda has developed. As such, all of the changes I make are with that thought process in mind and you should hopefully not even notice your game has been modded. Select which version applies to you - either Fallout 4, Fallout 4 with Far Harbor, Fallout 4 with Nuka World, and Fallout 4 Complete Pack for users with both Far Harbor and Nuka World. If you have any DLC other than Far Harbor and Nuka World, use the Fallout 4 version. Place "Cyan's Armor Mod.esp" and "Cyan's Armor Mod - Main.ba2" into your Data folder. - Now applies to all clothing, outfits, and hats where deemed acceptable. - Features three options presented after a short delay upon loading into the world. Ballistic Weave functions normally (hats and clothing with Ballistic Weave stack with armor). Only one instance of Ballistic Weave works with armor (either hat or underarmor, not both). Ballistic Weave has no effect when any armor is equipped. - If you wish to change these features at a later date you may add/remove perks as you see fit. Remove either of the following two perks to revert to normal (same as option 1), depending on which option was chosen. If you're unsure which option you chose, just remove both perks. - You will now be provided with a holotape that will let you change these settings at any time in the event that you decide to change your mind. - Now features nightvision capability with four options to choose from. Auto-Detect - Adds nightvision that activates automatically under certain conditions; during night time, when sneaking, or inside an interior area. Spec Ops - Adds nightvision that activates when wielding a silenced weapon. Stealth - Adds nightvision that activates when sneaking. Tactical - Adds nightvision that activates when any weapon is drawn. - All options will deactivate themselves automatically when the player enters the dialogue camera mode. - Now features the Jet Pack - Poseidon Core upgrade for T45, T51, T60, and XO1 power armor variants that enables jet-assisted boost while jumping. Comes equipped with its own power core for enhanced performance that doesn't drain fusion cores. Requires Science and Armorer 4. - Standard Jet Pack now requires Science and Armorer 2 instead of 4. Otherwise unchanged. - Two new upgrades for all main armor chest pieces; Padded Asbestos Lining and Dense Asbestos Lining. Combines the effects of Asbestos Lining mods and Padded/Dense Lining mods respectively. Padded Asbestos requires Demolition Expert 1 and Armorer 3. Dense Asbestos requires Demolition Expert 1 and Armorer 4. (v1.1) Padded Asbestos (Disciple/Operator/Pack armor) requires Demolition Expert 1 and Armorer 4. (v1.1) Dense Asbestos (Disciple/Operator/Pack armor) requires Demolition Expert 3 and Armorer 4. - All component requirements, weight, and value of each individual mod (asbestos and explosive mod) have been combined into the final product. Reduced weight of Combat Armor right leg from 4 to 2 to match the other limb pieces.